This is the perfect snack for those who need something sweet in the afternoon, but it’s a healthy recipe because it’s sweetened only with banana and dates. It’s very easy to prepare and will be loved by adults AND children, so don’t forget to add it to your Healthy Meal Planning. My friend Vivi is a big fan of my healthy Nutella recipe with carob. One day she told me that she would have loved to use carob in some other recipe too. 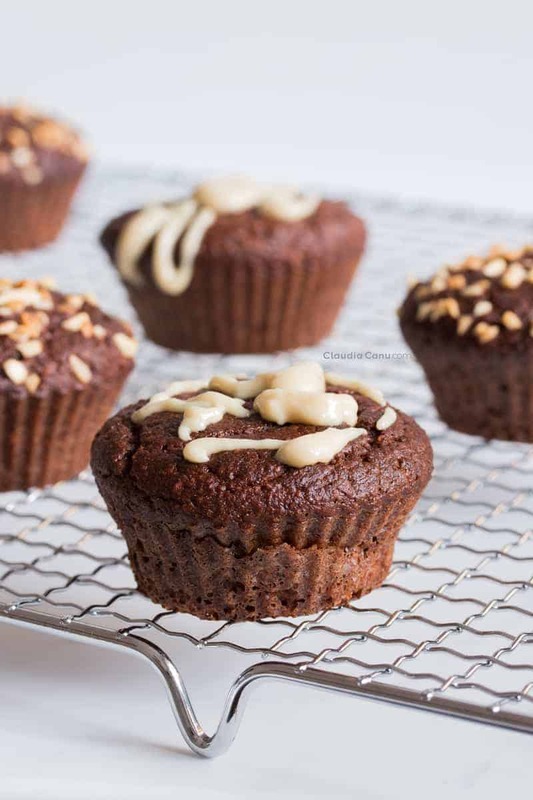 This is how the idea of these gluten-free chocolate and carob muffins came about, which are very easy to prepare and perfect for a healthy snack. 1. Let the dates soak in hot water for about 10 minutes. 2. Mix all of the wet ingredients. 3. Mix all of the dry ingredients. 4. Pour the batter into the molds and bake for about 25 minutes. The only thing that you should keep in mind is that it would be better to leave them on a cooling rack as soon as you take them out of the oven. This will prevent them from getting too wet. In case you are wondering, I bought the cooling rack that you see in the photos from Claudia & Julia’s online store. 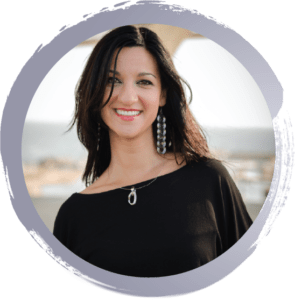 If you are not familiar with carob, I invite you to read my Energy Ball recipe where I talk about this ingredient and I tell you why I usually add it to my recipes. In any case, keep in mind that it is not an essential ingredient and you can substitute it with cocoa. So, instead of using one tablespoon of cocoa and one of carob, you can use two tablespoons of cocoa. 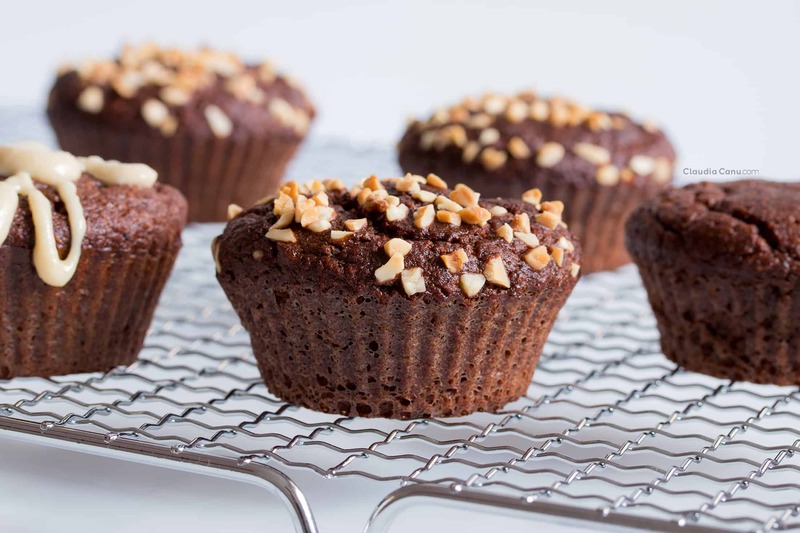 The difference is that if you use only cocoa, the muffins will taste a bit stronger than if you mix cocoa and carob. The same goes for the yogurt. Make sure it is natural and without added sugars. It is also highly recommended to buy it organic and, even better, if you get goat yogurt. Keep in mind that this recipe could be prepared even without the yogurt, which is actually used to provide more moisture and fluffiness. If you are lactose intolerant, you could even try to prepare the recipe with soy yogurt. I haven’t tried it myself, but I do not think it should be a problem. Please, let me know if you try it. If you are not a celiac and you don’t have gluten intolerance, there are doctors who recommend not changing to a gluten-free diet because there’s a possibility that your body will get used to not digesting that protein and, as a consequence, it could cause an intolerance. 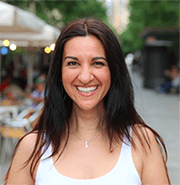 I confess that, when I started looking for a change towards a healthy diet, I went through a phase in which I believed that eating gluten-free would help me lose weight. That was what I had perceived while reading certain articles, but I could not be more wrong. I started buying gluten-free bread and pastries, spending a lot more money, without being aware that all of those gluten-free industrial products carry a lot of added sugars to give a more pleasant taste to the foods in the industry for the production of gluten-free foods. Today, I no longer believe that eating gluten-free helps you lose weight, but I know that using natural foods, and the least refined possible, helps maintain a balanced diet. In addition, there are some doctors who recommend a minimum consumption of gluten, or better said, of foods that naturally contain gluten, because they claim that it causes inflammation. So I believe it’s not a bad idea to have an alternative recipe for gluten-free muffins. What I like most about this recipe is that these muffins are sweetened only with fruit, without any added sugars or sweeteners. From personal experience, I usually store my backings made with banana in an airtight container, preferably a glass one, and leave it in the fridge. The times when I didn’t store it in the fridge, I noticed that it alters the taste of the banana and I personally don’t like it very much. Once, I’ve even tried to freeze these gluten-free muffins. Once thawed, they were still very good, as they had maintained the same consistency and flavor. However, when I tried to freeze a loaf of banana bread, I didn’t like the taste after it was thawed. I think it was probably because it had a higher quantity of banana. Needless to say, they are ideal to take to work or a picnic and, if you have children, they are perfect as a snack after school. 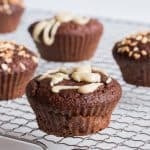 I love being able to try different versions of the same recipes, and that’s why in the photos and video of these muffins some of them have almonds on top. In the recipe instructions, I also tell you that you can add granulated almonds to the same batter to provide a crispy touch. I’ve also tried a version with grated coconut on top and it’s also delicious. I haven’t experimented with other flavors yet, but one option could be to substitute cocoa and carob with blueberries or raspberries. I’ll let you know if I try any of these two versions. What do you think of this recipe? Will you probably make it? If you do, do not hesitate to leave a comment below and tell me what you think. You can also rate the recipe by using the stars on the top of the comment box. A thousand thanks for stopping by my blog! 45g (about 3 large) pitted Medjool dates – If they are small and with less meat, use 5 and let them soak for 10 minutes in hot water before using them. 1. Soak the dates in hot water for about 10 minutes. 2. Heat the oven to 180ºC (350ºF). 3. In a food processor, add the banana, the dates (without the water), 2 eggs and 2 tablespoons of yogurt. Turn on the processor and mix everything until there are no lumps. 4. Add the rest of the ingredients: ½ cup (50 g) of almond flour, ¼ cup (30 g) grated coconut, 1 teaspoon (5 g) of yeast, ¼ teaspoon baking soda, ½ teaspoon of cinnamon, 1 tablespoon of pure cocoa powder, and 1 tablespoon of carob in the same processor and mix for a few more minutes until there are no lumps. 5. Bake for 25 minutes. Use a toothpick to make sure they are done. Insert it at the center of a muffin. If it comes out dry, it means that they are ready. 6. Take them out of the mold and let them cool on a cooling rack. If you like almonds, you can add ¼ of a cup of granulated almonds to the same batter to give it a crunchy touch, or you can use it simply as decoration on top. I’ve recently discovered that I’m gluten intolerant and my first reaction was getting depressed because I was not be able to eat my favorite desserts anymore. Then I find recipes like this one and everything is good again! 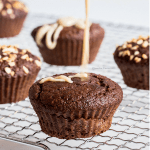 The best gluten free muffins I’ve had – hands down! These are tasty, healthy and easy to make. I recommend Claudia’s muffins highly – especially for a pre-workout snack!